The efforts made by Russians from all corners of the country to get to Sochi are a sign of the changes global sporting events are undergoing as new regions open up to sport-starved spectators. Sochi? Who’d go there? From the moment the Black Sea resort was awarded these Games to the eve-of-competition poll which found that, statistically speaking, not a single Russian was willing to spend his or her hard-earned kopeks on a trip to the Olympics, the question has been constantly posed. Sometimes with angst, sometimes with scorn, always with a suspicion that the whole exercise was a whisker away from embarrassing failure. The reality has proved rather different. 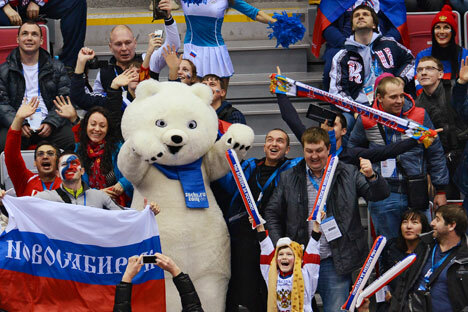 From Magadan to Murmansk, Ust-Kut to Ust-Ilinsk, from Sakhalin to Salekhard, fans have flocked to Sochi from all corners of Russia to claim their slice of the Olympic experience. At least, that seems to be the evidence of the flags and banners on display during the hockey tournament, a colorful line-up that has had even the most experienced traveler reaching for the atlas. Come in, sit down, have a drink! That astonishing range of flags fluttering in the arenas has been one of the most encouraging details of the Sochi Olympics. Above all, the vast number of Russian cities and regions represented seems to support claims that the event has become “Russia’s Games”. One of the biggest problems with any Olympics is finding a way to involve people outside of the host city. In a country the size of Russia, where any venue is going to be hugely remote from a sizeable chunk of the population, that issue is exacerbated by simple geography. That was part of the inspiration behind the lavish and protracted torch relay: beneath the posturing of sending the Olympic flame up Europe’s highest mountain and into the depths of the world’s deepest lake, there was an identified need and desire to involve as many people as possible in the Olympic build-up. It’s impossible to judge how much of that has persuaded Russians to make often long and costly journeys to cheer for their favorites, but it runs counter to the gloomy pre-Games predictions that crowds would be limited and few would take the chance to enjoy a major event in their homeland. There are suggestions that there are fewer international fans than usual. A combination of distance, pre-Olympic uncertainty about Sochi’s readiness for action and reportedly inflated transportation costs have deterred many. At the same time, however, part of the purpose of making events like the Olympics and the World Cup a travelling circus rather than a fixed-venue tournament is giving opportunities for the widest possible audience to be a small part of a big show. The influx of first-timers at a big sporting event – many of whom will be enjoying a literal once-in-a-lifetime experience in a country where barely 20 percent of people have a passport – fulfils part of what the Games aim to do: they inspire, they excite, they bring people together. The experience of Euro 2012 in Ukraine was similar, despite another bout of hand-wringing from Europe’s more affluent nations. Freed from EU visa demands, football fans from countries like Azerbaijan and Kazakhstan came for their first taste of a major competition; the upcoming ice hockey world championship in Minsk is set to continue the trend for Belarusian hockey fans. These might not always be the easiest of destinations for Western sports fans, but perhaps it’s finally time to acknowledge that the sporting world is getting wider than ever, and spreading major events more widely around the world helps to reflect and encourage that trend.